What two Michigan brothers believed was an old sheet in a family trunk may have contributed to the end of slavery in America. 1860: a time of furious national debate and mounting tension. 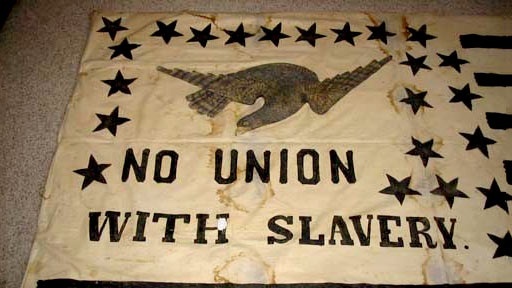 Abolitionists in the North demand unconditional freedom for slaves in the South. Many help slaves escape on the Underground Railroad. At meetings and rallies, black and white abolitionists bring the dispute to a fever pitch, polarizing entire communities, sometimes to the point of violence. Was this sheet a flag used to campaign for the creation of Free States? Or was it used as propaganda in a pivotal pre-Civil War campaign? History Detectives explores the politically charged abolition movement to reveal the surprising past of this family and their flag. Also with Tukufu Zuberi Airstream Caravan Was this mobile home part of a modern-day wagon train halfway across the world? Also in Season 2 Warner's Lighter What is the connection between Harry Warner and a studio associated with the Nazi party? Also with Tukufu Zuberi Kahlil Gibran Painting Is this painting an unknown work by an immigrant poet whose words inspired an American generation? Related Investigation Body In The Basement Are these the remains of an executed prisoner of war from an English Civil War battle? Also with Wes Cowan Bonnie & Clyde's Bullets Are these the bullets that ended one of the most infamous crime-sprees in American history? Related Investigation Liberty Bell Pin Was one of America’s most iconic symbols melted down into a mere memento?